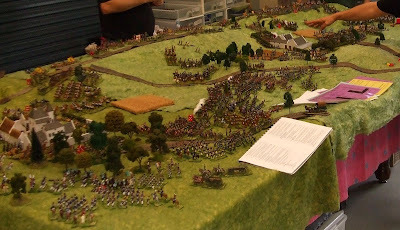 I got an invitation by Donald brown ,Daniel Oliphant & Malcolm Robinson to play there demo game of The battle of Waterloo at the Pine Rivers Model Train and Hobby Expo this year. It was an awesome weekend & Here are some photo. The battlefield field was about 9 ft x 6ft with more the 2500 1/72 scale figures on the battlefield field. Custom made terrain & buildings made by Daniel Oliphant. The terrain was foam tiles covered in carft hair .